Trump Turnberry paying women employees less than men from The Scotsman – A investigation into how Trump Turnberry, US President Donald Trump’s flagship resort in Scotland, is paying women less in wages and bonuses, with men outnumbered women by 4:1 in senior executive roles. 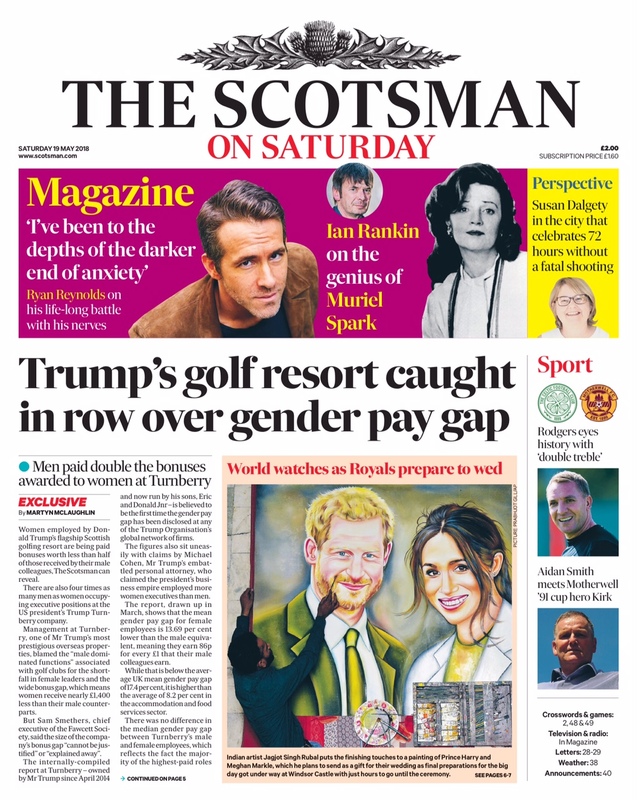 Women employed by Donald Trump’s flagship Scottish golfing resort are being paid bonuses worth less than half of those received by their male colleagues, The Scotsman can reveal. There are four times as many men as women occupying executive positions at the US president’s Trump Turnberry company. Management at Turnberry, one of Mr Trump’s most prestigious overseas properties, blamed the “male dominated functions” associated with golf clubs for the shortfall in female leaders and the wide bonus gap, which means women receive nearly £1,400 less than their male counterparts. But Sam Smethers, chief executive of the Fawcett Society, said the size of the company’s bonus gap “cannot be justified” or “explained away.” The internally compiled report at Turnberry – owned by the president since April 2014 and now run by his sons, Eric and Donald Jr – is believed to be the first time the gender pay gap has been disclosed at any of the Trump Organisation’s global network of firms. The figures also sit uneasy with claims by Michael Cohen, Mr Trump’s embattled personal attorney, who said the president’s business empire employed more women executives than men. The report, drawn up in March, shows that the mean gender pay gap for female employees is 13.69 per cent lower than the male equivalent, meaning they earn 86 pence for every £1 that their male colleagues earn. While that is below the average UK mean gender pay gap of 17.4 per cent, it is higher than the average of 8.2 per cent in the accommodation and food services sector. There was no difference in the median gender pay gap between Turnberry’s male and female employees, which reflects the fact the majority of the highest-paid roles are filled by men. The widest gender gap was to be found in the bonus culture at the 800 acre resort. The average median bonus paid to men is £2,506, but the sum drops to just £1,116 among women, a shortfall of 53.5 per cent. The average mean bonus paid to men is £3,317, which drops 48.9 per cent for female employees, who receive £1,695. While seven women received bonus in the 12 months to April 2017, the number jumped to 11 for men. While some 46.8 per cent of the lowest paid jobs at Turnberry are occupied by women, the percentage drops to just 31.2 per cent for the highest paid quintile. 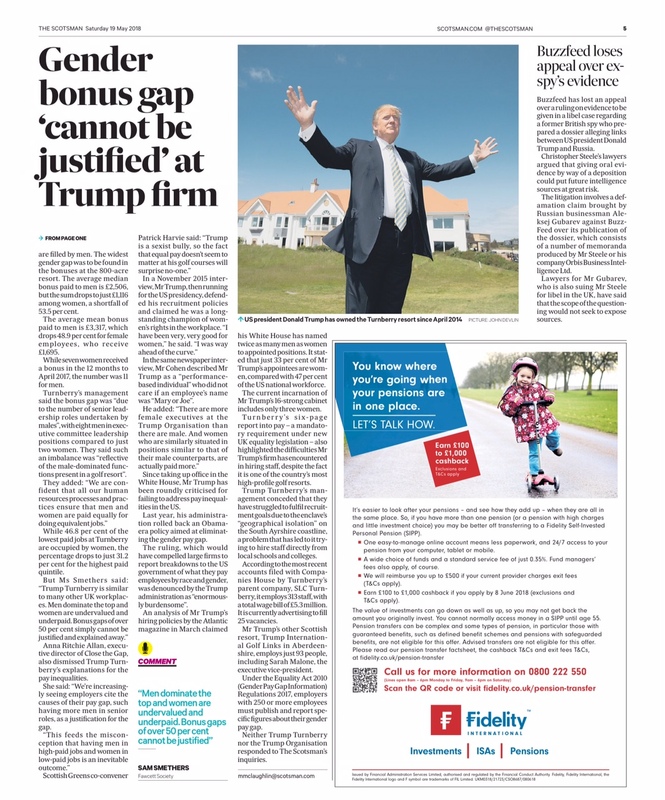 Anna Ritchie Allan, executive director of Close the Gap, also dismissed Trump Turnberry’s explanations for the pay inequalities. She said: “We’re increasingly seeing employers cite the causes of their pay gap, such having more men in senior roles, as a justification for the gap. She added: “Identifying why you’ve got a pay gap should just be the first step. Addressing pay discrimination is critical, but companies also have to look at the types of jobs men and women are doing. Since taking up office in the White House, Mr Trump has been roundly criticised for failing to address pay inequalities in the US. Last year, his administration rolled back an Obama-era policy aimed at eliminating the gender pay gap. An analysis of Mr Trump’s hiring policies by The Atlantic magazine in March claimed his White House has named twice as many men as women to appointed positions. It stated that just 33 per cent of Mr Trump’s appointees are women, compared to 47 per cent of the US national workforce. The current incarnation of Mr Trump’s 16-strong cabinet includes only three women. Turnberry’s six-page report into pay – a mandatory requirement under new equality legislation – also highlighted the difficulties Mr Trump’s firm has encountered in hiring staff, despite the fact it is one of the country’s most high profile golf resorts. Trump Turnberry’s management concede that they have struggled to fulfil its recruitment goals due to the enclave’s “geographical isolation” on the South Ayrshire coastline, a problem that has led to it trying to hire staff directly from local schools and colleges. The data in its gender pay report was based on payroll records from April last year. Neither Trump Turnberry nor the Trump Organisation responded to The Scotsman’s enquiries. According to the most recent accounts filed with Companies House by Trump Turnberry’s parent company, SLC Turnberry, it employs 313 staff, with a total wage bill of £5.3m. It is currently advertising to fill 25 vacancies. Mr Trump’s other Scottish resort, Trump International Golf Links in Aberdeenshire, employs just 93 people, including Sarah Malone, the executive-vice president. Under the Equality Act 2010 (Gender Pay Gap Information) Regulations 2017, employers with 250 or more employees must publish and report specific figures about their gender pay gap. Organisations with less than 250 employees can publish the data voluntarily but are not obliged to do so.